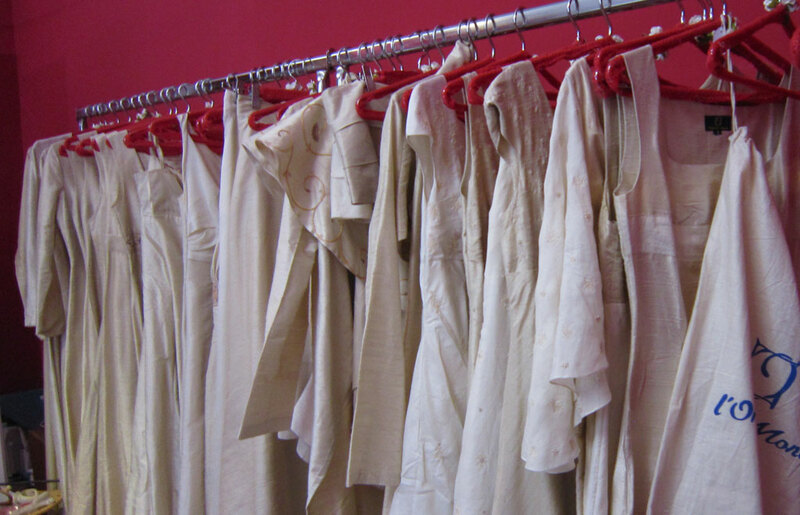 On Ethicalista are many the chances to talk and discuss Sustainable Fashion. Many the events, seminars and shows to promote and advertise about this growing direction fashion is taking. 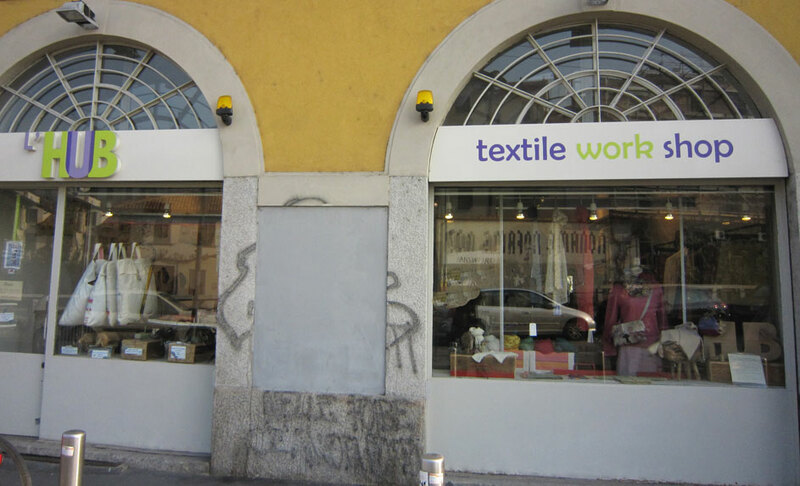 Day by day Sustainable Fashion is permeating shopping areas, so is no surprise to find interesting and pleasant examples in a place like the Navigli in Milan where, since many years, fashion and design meet the city in a very accessible way. 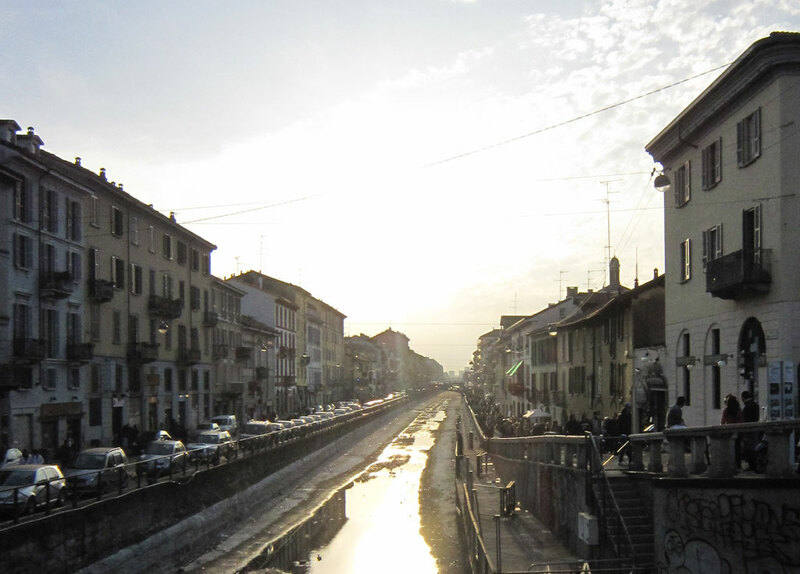 The Navigli are well known for the lively atmosphere one can feel through out the day. Mostly pedestrian, full of cafes, bars and restaurants that at night occupy large part of the road with tables and chairs. Many the artisan and antiques shops on both sides of the Naviglio Grande, one of the only water channels left open in town. L’Hub – Ripa di Porta Ticinese 69 – is a fantastic space where craftsmanship, tradition and education get together to offer products, ideas, courses and more. On one hand you can find beautiful fashion, or get inspiration and tutorship to realize some project, on the other you can start your trip into tailoring taking you “license” – a series of lessons at different levels to learn how to cut an sew – or simply rent a machine by the hour. Of course there possibilities and the offers of l’Hub are far more, from vegetable dyeing courses to the selection of printing wood blocks from the Zucchi Collection. Only a visit can really explain this place. 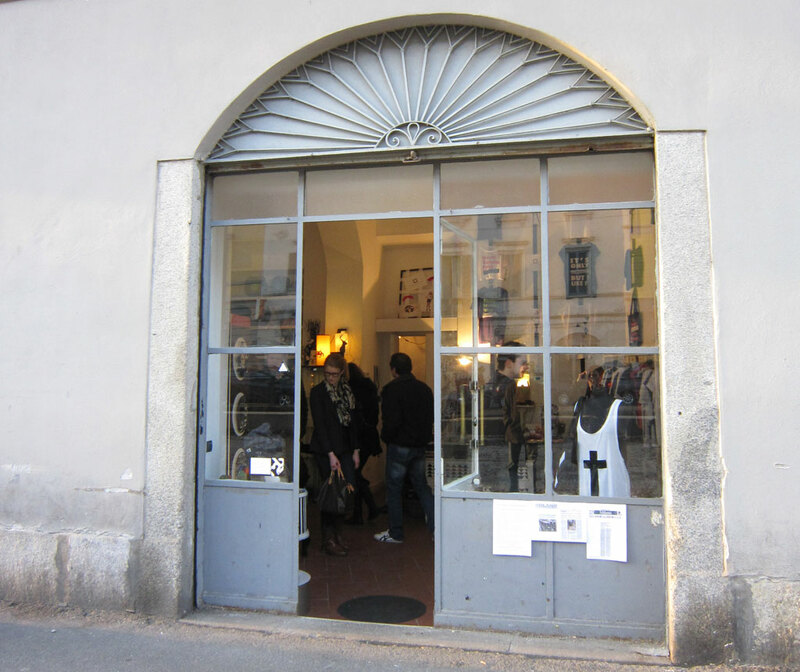 L’Orlo del Mondo – Ripa di Porta Ticinese 47 – is a unique place for brides to be, here esthetics and Fair Trade really find on of their best unions. They propose a large selection of bridal gowns made with handloom silk and tailored in India from Italian design, all this in full respect of Fair Trade principles. Superfly Vintage – Ripa di Porta Ticinese 27 – was born from passion in research and to those styles from the 50’s till the late 70’s with special attention to music, cinema and attention to details. Made in the Shade – Ripa di Porta Ticinese 53 – probably one of the only places in town where to find Toms Shoes and their fantastic “Buy One Give One” initiative, and the style and comfort Swedish Hasbeens. 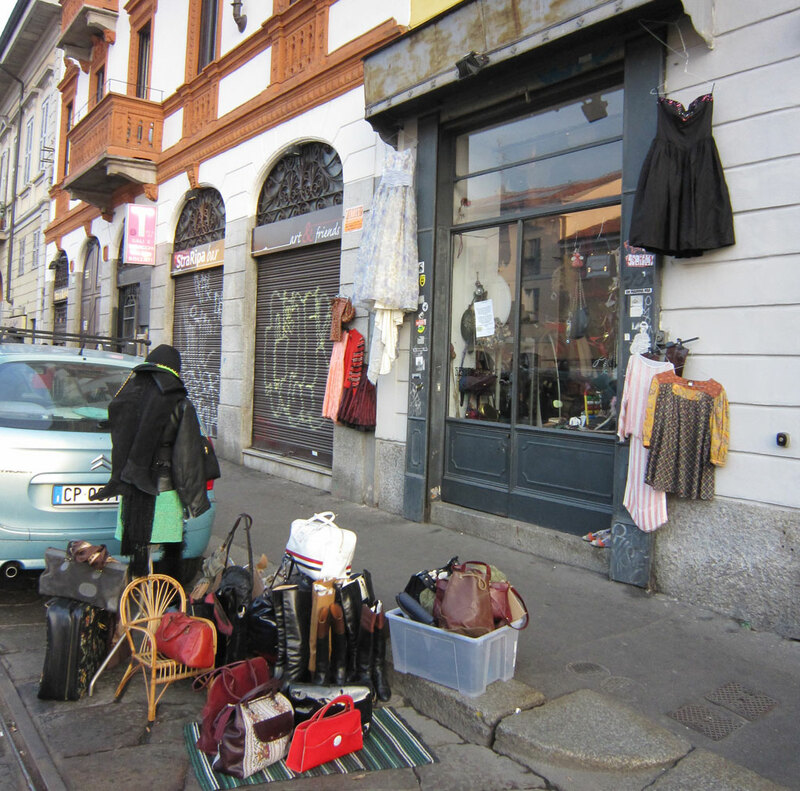 Reruns Strascé – Ripa di Porta Ticinese 21 – is another vintage shop, very well known not only in town, mentioned even on the New York Times. Messy, overloaded but always surprising. Meet 2 Biz – Alzaia Naviglio Grande 14 – is something in between a showroom, a concept store and a temporary shop. What for sure is one of the largest showcases of interesting, innovative collections of young designers work in Milan. A place where creativity, recycling, fashion and sustainability find real expression. Among the many brands present, extremely interesting the work of: Laboratorio Procaccini Quattoridici – nice and simple line of clothes made with reclaimed fabrics and garments realized by a social cooperative working with mentally disabled people; Alf Re-ctiation – belts and other stuff from unusual recycled materials; Mnmur – bags and accessories from recycled bicycle tubes; GarbageLab – bags and accessories from recycled advertisement PVC boards. Here is a Google Map of Ethical Shopping in the Navigli area in Milan. It was 1995 when a small group of people started a cultural association named “Cose dell’altro Mondo“. 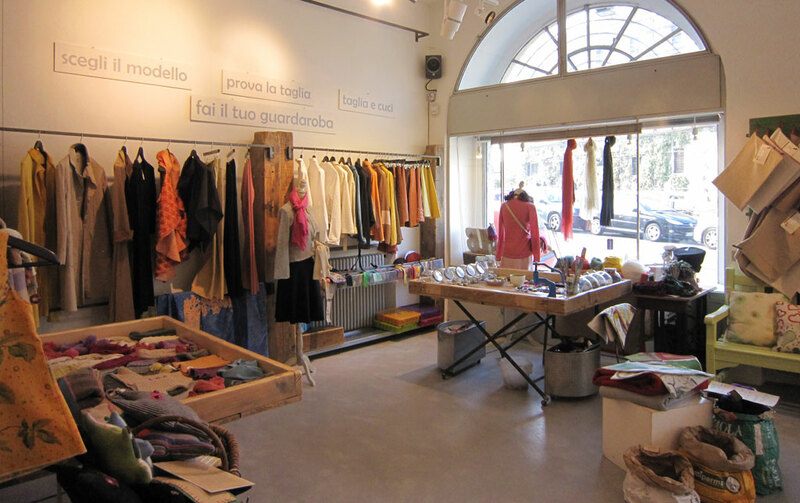 It was one of the first Fair Trade experiences in Milan. Later, after having opened in 2001 a new space all dedicated to weddings, in 2004 they launched the first Fair Trade clothes collection in Italy branded as “L’Orlo del Mondo“, that in 2008 become an exclusive wedding gowns collection. Behind this new direction there are different people and professionals. The clothes are all made in India by the artisans of Craft Resource Center – CRC, a Fair Trade Organization member of WFTO (the World Fair Trade Organization) since 2004. Every part of the dressed are hand made, from the fabric – mainly handwoven silks – to the embroidery then stitched and sewed together by master tailors in the outskirts of Kolkata. All designs and patterns are realized by the Cose dell’altro Mondo staff with the consultancy of Andrea Orazi. L’Orlo del Mondo wedding dresses are simple and charming with light embroidery in pastel colours. 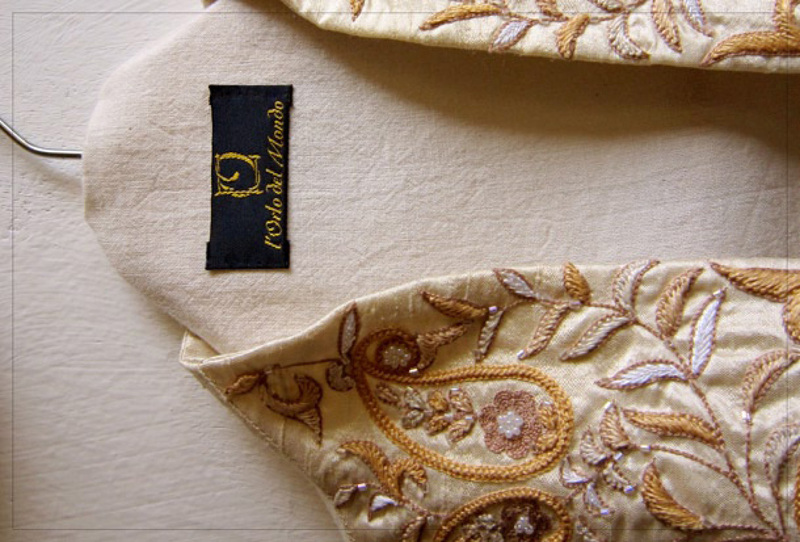 The fabrics are mainly off-white or cream doupion and khadi silks with some inserts of Aimsha silk – realized without killing the bug. Obviously in a wedding the dress is probably one of the most important parts, but of course there is much much more. Gifts for each invitee (“bomboniere” in Italian); traditional almond or chocolate candies, invitation cards, wedding gifts and accessories for maids of honor and groom’s moms. All together a great and unique Fair Trade experience.